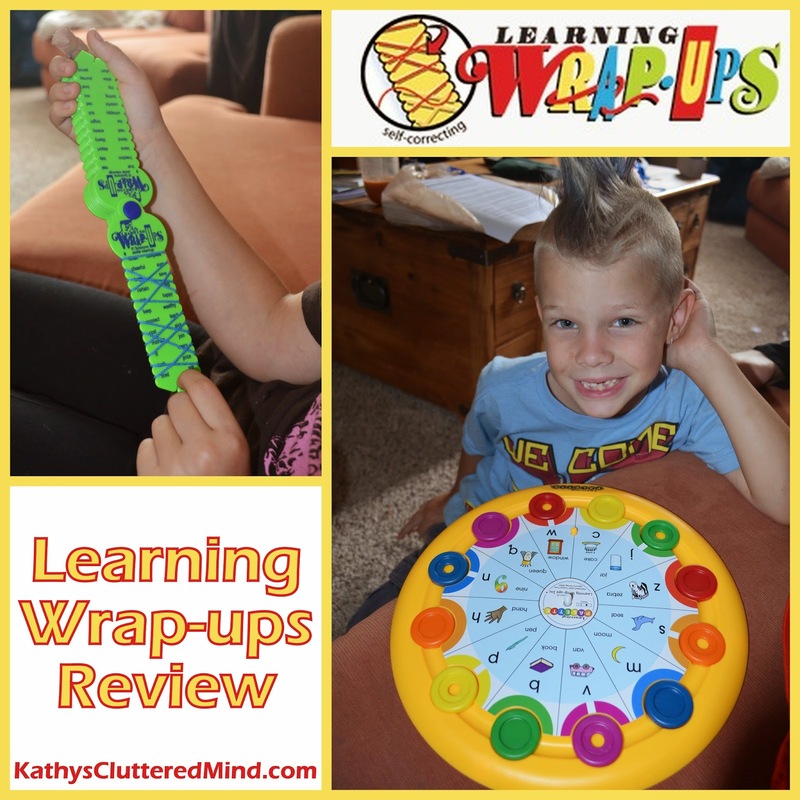 Learning Wrap-ups was created by Marion Stuart a 4th grade school teacher that was looking for a way to assist her students with learning their multiplication tables quickly. But she needed something that appealed to all children. After many trials and errors she came up with the brilliant idea of matching problems to the answers on a handheld card with a string. The response was great not only from her students but from her colleges as well. And so Learning Wraps-ups was born! Learning Wrap-ups has been growing ever since adding new products all the time. We received several products to review so warning this is going to be a pretty lengthy review. Below I will give a breakdown on each product along with our personal thoughts. Here are the items we received. All of the products are designed for children in grades K-5th. 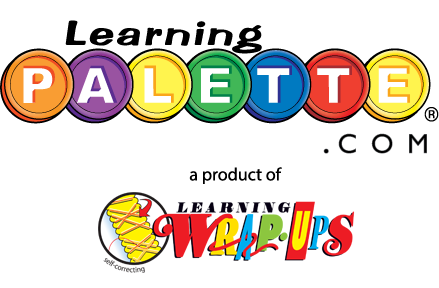 These learning tools as well as the other tools available from Learning Wrap-ups make great hands on supplements for public schools and homeschools. Their product line currently consists of products to help children with Pre-Algebra, Vocabulary, Early Childhood, Sight Words/ESL, Spanish, Science, and even Keyboard Theory for the piano. Marion has also written several workbooks and the Learning Wrap-ups also has a line of "Wrap-up Rap" audio CDs that work with, or independent of Wrap-ups. All of the Learning Wrap-up products are self correcting so the most children can easily work independently, which is a huge plus for busy teachers and parents. I choose to go with 1st grade for both the reading and math kits so both children could utilize them (ages 6 and 8). Several times a week the children would pull the Learning Palette kit off the shelf and each work through 3-5 cards (from each kit) at their own pace. The Learning Palettes are so simple to use and my children had no problem doing the them all on their own after being shown one time how they work. Simply remove the colored disks from the palette. Position the chosen card, question side up on the palette base (there are two pegs to help guide the card on properly). 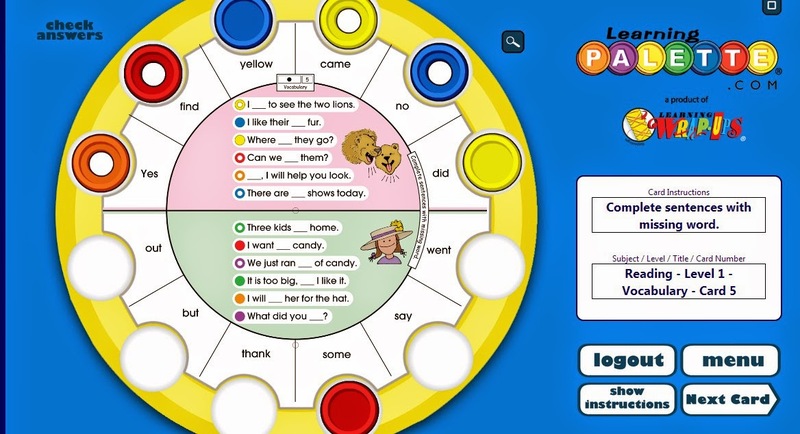 Answer the questions by placing the colored disks in the slot containing the correct answer. After all 12 questions are answered you simply turn the card over (again lining up the pegs) to check the answers. If done correctly each of the colors on the card will match the disks. Both children thought that the Learning Palettes were games, so they didn't even realize they were learning which is perfect for our unschooling lifestyle. They never needed to be forced to pick them up and I would often find them bringing them along on car rides or just sitting on the sofa playing with them. Learning is so much better when it's fun and not forced. Both of my children are visual, tactile and independent learners so Learning Palettes really helped them embrace how they learn best. 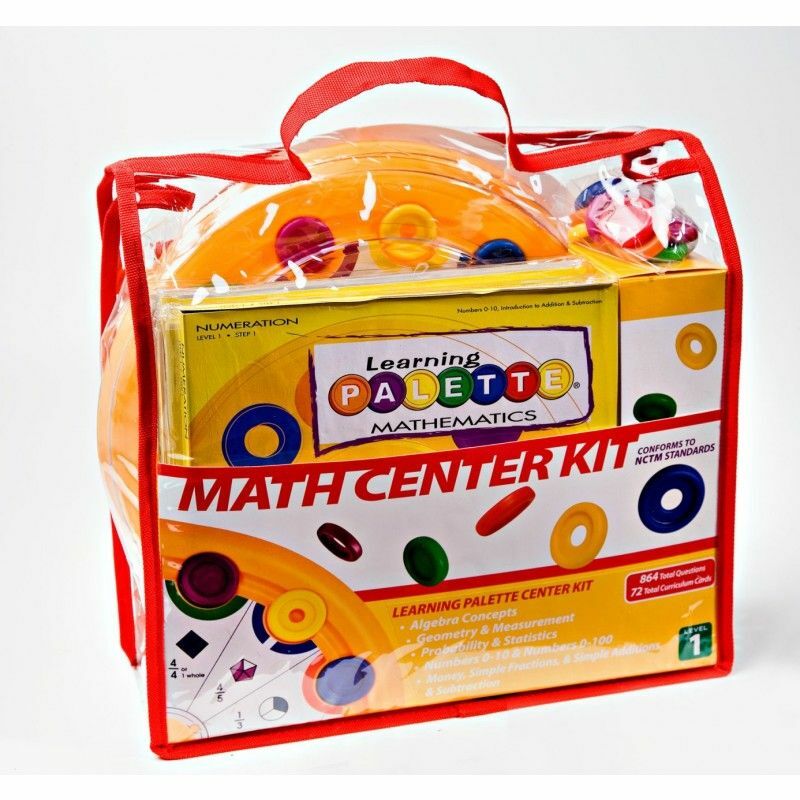 The math kit comes with one base and 5 curriculum packs (each containing 12 cards). There are 864 questions total....that's a lot of learning! The base that comes with the kit will work with curriculum packs for other grade levels so you only need to purchase one base (unless you have multiple children who may fight over it). The kit comes with a nice vinyl storage/carry case, which makes it great for storing and perfect for on the go learning. The 1st grade math kit covers algebra concepts, geometry, measurement, probability, statistics, numbers 0-10, numbers 0-100, money, simple fractions, simple addition and simple subtraction. The kit is correlated to common core and state standards. 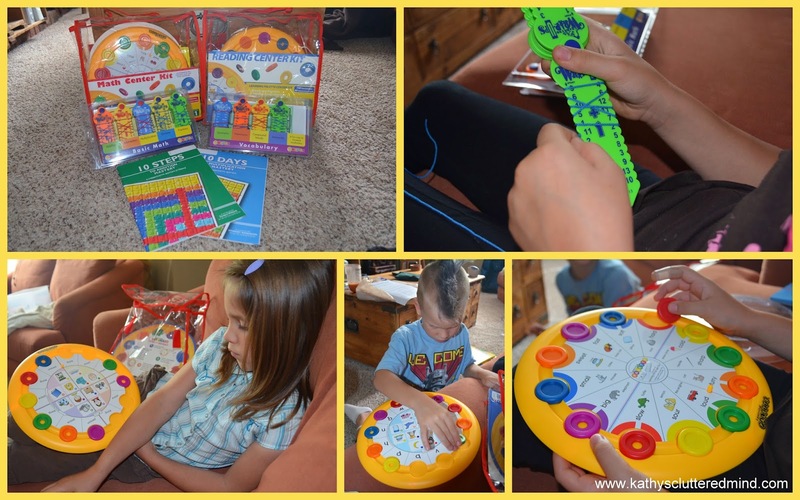 Both children prefer hands on practical math so these were perfect for our family. 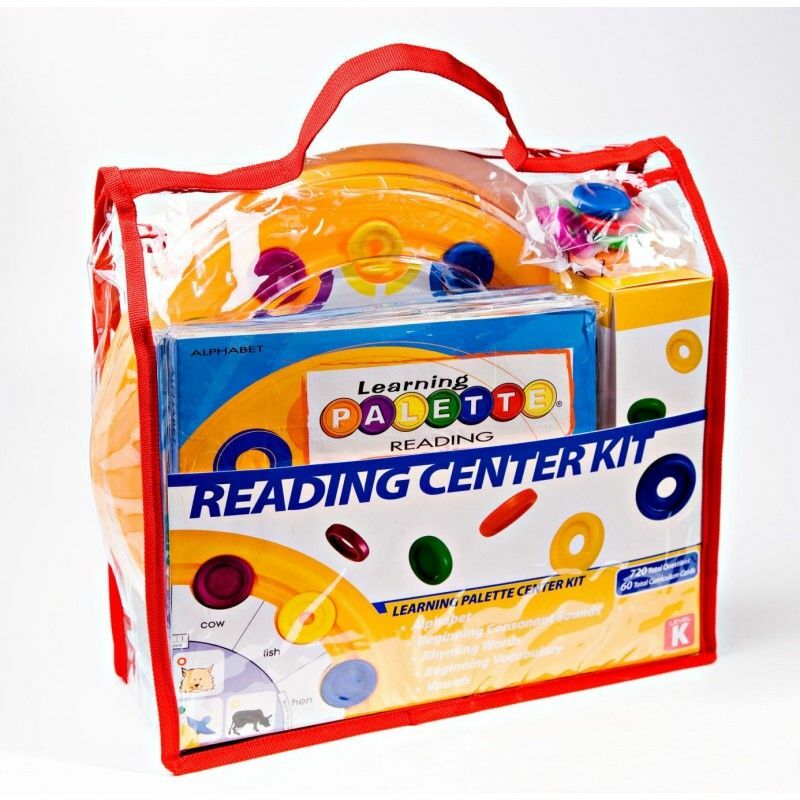 The reading kit comes with one base and 5 curriculum packs (each containing 12 cards). There are 720 questions total, for hours of reading fun! The base that comes with the kit will work with curriculum packs for other grade levels so you only need to purchase one base (unless you have multiple children who may fight over it). The kit comes with a nice vinyl storage/carry case, which makes it great for storing and perfect for on the go learning. The 1st grade reading kit covers blends, digraphs, reading comprehension, nouns, verbs, adjectives, vocabulary and phonics. The kit is correlated to common core and state standards. Gwyn my budding reader was very proud that she could accomplish many of the cards completely on her own and get 100% right almost every time! We ran into one slight issue with some of the vocabulary cards that left the children and me confused and frustrated. Some of pictures on the cards can easily be viewed by children and even adults differently than Learning Wrap-ups anticipated. For example on one particular card the children thought that the picture of the circus was a tent, the giant a man, the mouse a rat and the quilt a window. Now with some critical thinking and process of elimination you can get the right answer, however they became so frustrated (especially my son) and were upset that they could not complete it without my help. And even with my help we somehow managed to get one wrong. The children really enjoyed the Learning Palette subscription. An online 1 year family subscription gives up to five members access to math and reading palettes. The program shows children a palette on the monitor which resembles the physical palette and works the same way. Simply drag the correct colored mark to the corresponding question. 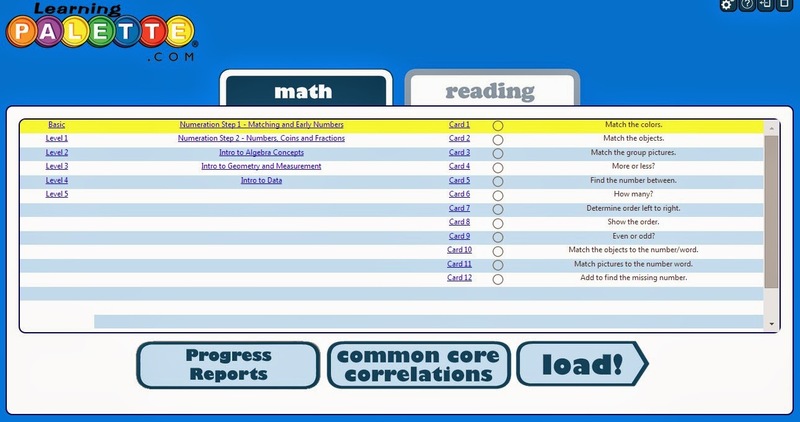 There are 35 math titles and 20 reading titles with over 7,920 questions. The platform is simple to use, fun, interactive and game-like. 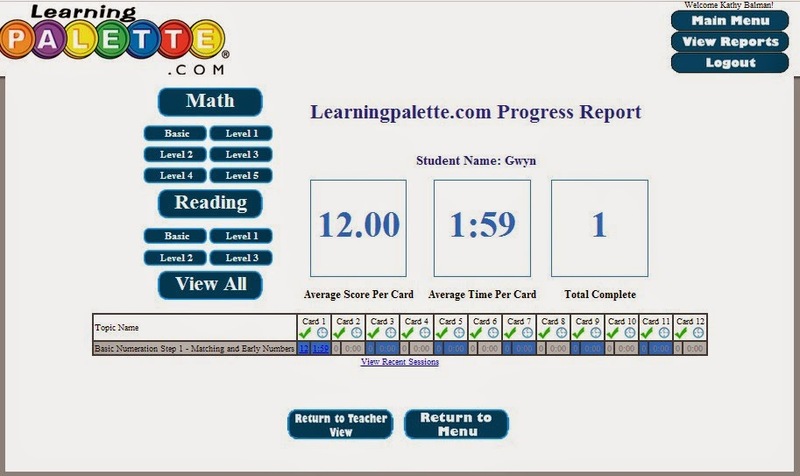 The program also tracks your child's progress so you can create customized reports. This is a great option for families on a budget. 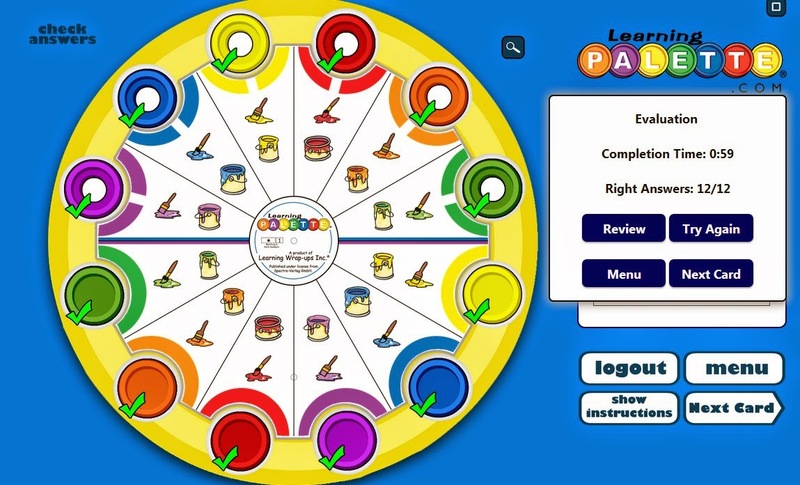 Visit LearningPalette.com to watch a video introduction or try out a demo. The children had no issue navigating the online program and after being shown once they were off on there own. It is really simple to use and great for visual and tactile children. They would often hop on the program on their own before I was even out of bed. If you enter coupon code HOMESCHOOL at checkout you can receive a 20% discount. Wrap-up products are self correcting just like the palettes. They are fun, durable and the perfect size for little hands. The Wrap-ups are made from durable plastic so they will last for years. I would personally say that these are better for older elementary children. My 6 and 8 year old required help with the majority of the vocabulary boards and were not ready for most of the math boards. Again these were more like a game for the children so they don't even realize they are actually learning. They only worked with these a couple times a week. Like the palettes they were great for on the go learning too! Wrap-ups not only help children learn important math and reading facts but they also help with eye-hand coordination, motor skills, logic thinking and self image. Each kit comes with a teachers guide that included a short how to use guide, self graphing chart, self recording chart, activity recommendations and some rewards and certificates. Each of the items in the guide may be reproduced too. To use Wrap-ups you simply hold the bundle at the top of the key and select the board you want to wrap. Then you begin with the string next to the first (top) number/word on the left. Then find the answer on the right and draw the string around the back to the next number/word on the left. Continue the entire way down until the board is complete. To add the auditory learning aspect it is recommended that children say the problem & answers aloud. When every question has been answered simply secure the string in the notch at the bottom then flip the board over to see if the string matches the lines. 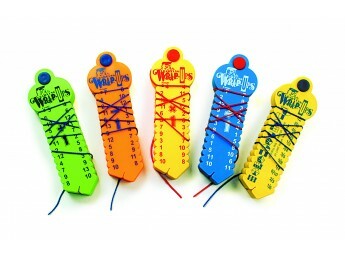 The math intro kit contains 5 keys: addition, subtraction, multiplication, division and fractions. It also includes the reproducible teachers guide. 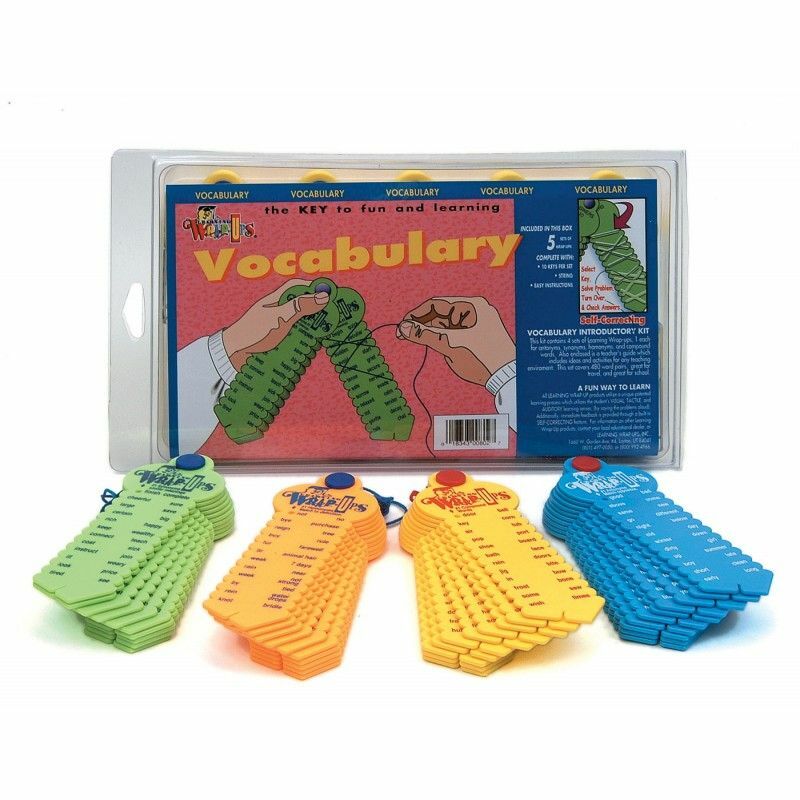 The vocabulary intro kit contains 4 keys: antonyms, synonyms, homonyms and compound words. It also includes the reproducible teachers guide. These two products are to be used along side the Wrap-ups. We haven't really utilized these workbooks yet but I did page through them. 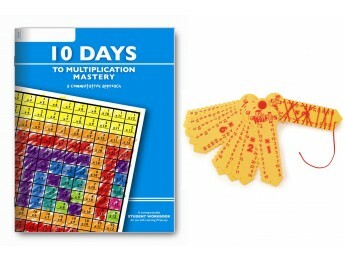 These are simply guides to help master multiplication and addition in 10 easy steps. They are nonreproducible and additional copies are only $4.99. Each workbook is 62 pages and and contains a conceptual explanation of addition/multiplication. There are also daily activities, worksheets, story problems, recording charts, and more. Gwyn, "I really like the learning pallets. They are so much fun and kind of like a game. You can do them in the car or at home. I like the online version too. I am getting really good at them and most of the time get everything correct. I like the wrap-ups too but mommy needs to help me with them." Price vary please see individual pricing above or visit the Learning Wrap-ups website for further details. They also recently added a designated homeschool section to their website. Click here for more Learning Wrap-ups reviews from the The Schoolhouse Review Crew.